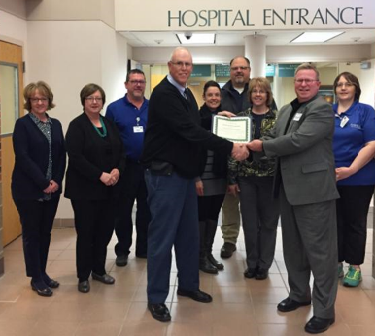 In 2015, Avera Holy Family Hospital (AHFH), located in Estherville, Iowa, partnered with four Emmet County emergency medical services (EMS) programs, the Estherville Police Department and Emmet County Public Health in a three-year continuous quality improvement (CQI) project. This project engaged EMS and hospital systems of care with collaborative prevention initiatives, data collection and evaluation, ongoing protocol development and training. During the first year of the program, AHFH conducted four collaborative CQI system meetings to accomplish several partnership development and strategic plan implementation goals. This project was successful in large part due to the leadership and support provided by the dedicated staff of AHFH.